The 5th edition of CSIL report The European market for RTA furniture aims to provide a detailed overview of the RTA furniture market in Europe through the analysis of the sector performance, the competitive system, its main actors, the supply structure and the distribution system and the main market trends. Distribution channels for kit furniture in Europe, with description of a sample of leading operators specialized in RTA furniture. NEW: This edition includes a focus on the RTA furniture market trends and main innovations with figures by product type, material, surface and type of finishing . Products covered : Living/dining room furniture (including sets for living/dining room, bookshelves, tables and chairs, occasional furniture); bedroom furniture; children furniture; office/home office furniture; bathroom and kitchen furniture. Note: By RTA furniture we mean the group of furnishing products which, according to the country of reference, are defined as flat-pack, ready to assemble (RTA), knock down (KD), DIY (do it yourself), self-assembly or kit furniture that come in flat-packs and include all the hardware and instructions necessary for assembly. In 2015 the consumption of RTA furniture in Europe reached a value of EUR 14 billion. In general, the RTA furniture market showed a better performance throughout Europe than the "fully assembled" furniture market, scoring a +13% in the time period 2010-2015 against the +3% of the latter. 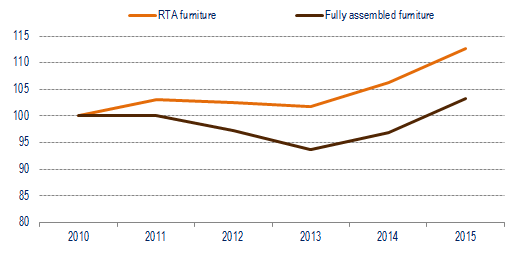 4.1 Production of RTA furniture in Europe and by geographical area (Western and Eastern Europe) 2010-2015. 4.2 RTA furniture exports. Export orientation by country, 2015. 1.1 The RTA furniture market. Country indicators and weight of RTA furniture production and consumption on total furniture (comparison with the European average). 1.3 Competitive system. A selection of leading RTA furniture manufacturers and their market shares.